Buddhist monks meditate at the Maya Devi Temple in Lumbini, the birthplace of Lord Buddha, Nepal. “The world faces numerous challenges, from conflict to climate change, from prejudice to growing inequality. We see people turning inwards and we see a crisis of solidarity,” said the Secretary-General in his address. Vesak, the Day of the Full Moon, generally in the month of May, is the most sacred day to millions of Buddhists around the world. It was on the Day of Vesak two and a half millennia ago, in the year 623 B.C., that the Buddha was born. It was also on the Day of Vesak that the Buddha attained enlightenment, and it was on this Day that the Buddha in his eightieth year passed away. 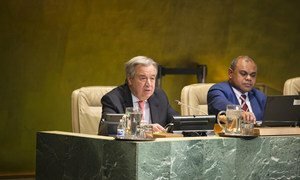 In his message, the Secretary-General highlighted Buddhism’s emphasis on non-violence as a powerful call for peace and said that the teachings of the Buddha remain very relevant in the work of the UN. Speaking alongside Mr. Guterres, Miroslav Lajčák, the President of the General Assembly also underscored the importance of the “timeless principles” of Buddhism to the work of the UN. “They offer insights and ideals on improving the condition of the planet; they show us the way to a more sustainable future. They remind us to recognise the inherent dignity of all people. They shine a light on the path to peace – peace among nations, and peace within people,” he said. In 1999, the UN General Assembly adopted a resolution in which it recognized the Day of Vesak to acknowledge the contribution that Buddhism, one of the oldest religions in the world, has made for over two and a half millennia and continues to make to the spirituality of humanity.